From the Mail Settings page you can enable, disable or edit the messages that are sent automatically for different actions within your website. Seller - new admin message: Sent to sellers when they receive personal messages from the administrator. Seller - auction about to expire: Sent to the owner of an auction the day before his auction expires. Bidder - auction closed: Sent to users that have placed bids on an auction that got closed. Bidder - successful bid: Sent to bidders when they place a bid (confirmation notification). Bidder - his bid canceled: Sent to bidder when his bid is canceled by the seller. Watchlist - auction about to expire: Sent to the followers of an auction the day before the auction will expire. Watchlist - new bid: Sent to the followers when a new bid is made on the auction they are watching. Admin - auction report: Sent to admin when an auction is reported. Admin - pay requested withdraw: Sent to admin regarding newly requested withdrawal made by a user. User - payment received email: Sent to a user when his payment is received. User - debtor notification: Sent to users when debtors plugin is enabled. User - added to blacklist: Sent to a user when he is added to blacklist by an auctioneer. 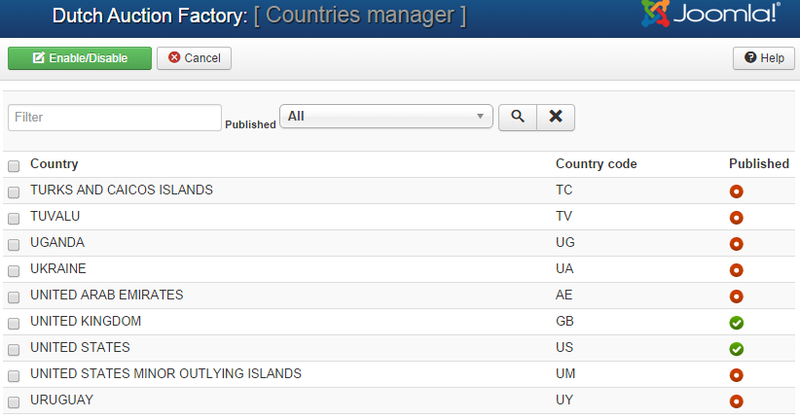 Countries Manager page allows you to set up which countries are published on frontend and which are not. From the Tools page you can manage your auctions data by creating backups. Restoring them or to simply clean up the database by deleting closed auctions. You can create a ".xls" file containing a list of all the auctions data available on your website or import a ".csv" file adding additional auctions. With Import Auctions from CSV, you can import data as a bulk upload, which will append the data to your existing database. This will help, for example, in populating your database much more easily, uniting the existing records which are kept in different formats. Having a .zip file containing images of these auctions can also be uploaded in the same way using the provided field. It is important to know that this feature requires strict conventions in the files to work properly. Each value is inserted in the database and the order must be respected. Custom fields are not supported. (!) For sample data and other info about the BULK import feature please check this page. By clicking on Backup Auctions and Images you will see the path where the ".zip" file will be saved. To proceed creating the backup, you need to be sure the path is Writable. Here you can also choose to download the file on your HDD and to delete the one saved on the server after the download occurs.